By bringing statistical approaches to the assessment of long-term probabilities and outcomes, actuaries have traditionally focused on the arenas of pensions and insurance. Due to the increased need for statistical decision-making in other forms of business, actuaries have now branched out, to the point where now only 30% of Actuaries Institute members work in traditional pensions/insurance fields. The long-term and quantitative approach of actuarial science makes it an excellent tool to use for maximizing long-term shareholder value. The actuarial valuation method follows a similar valuation process to traditional discounted cash flow techniques. It does, however, apply two key differentiators: 1) It works on an even longer-term basis of up to 80 years, and 2) it applies statistical probabilities to each cash flow to assess their individual chance of occuring. The statistics for calculating each cash flow can be ascertained from analyzing data provided by ongoing business operations. A cohort analysis tool in SaaS methods, for example, is an excellent source of customer intent and trends. How Can an Actuary Help to Enhance Business Metrics? Customer lifetime value (CLV) metrics can be expanded upon with the use of actuarial valuation methods. Taking a longer-term view on customer demographics and revenue potential can allow for a business to plan segmented marketing more sustainably. An actuarial valuation of CLV can provide more insight into retention rates, opportunity cost between channels, and holistic value-add to entire business units, not just divisions. Applying actuarial science to human resource metrics improves business intelligence over staff performance and allows for incentives to be aligned more correctly. Building a robust cohort analysis tool is the first step that an actuary can take to bring more data-driven decision-making to your metrics. With this in hand, probabilities can be attached to future cash flows, allowing for more clarity on business budgeting and liquidity expectations. With the probabilities and behaviors of different cohorts analyzed, an actuary can start working with the sales team to tweak pitch efforts as well as increase revenue and retention. If you are looking to acquire another business or gain more insight into the valuation of your own, an analyst can build an actuarial valuation DCF to help you to understand more clearly the future risks in play. Together with their focus on long-term time horizons and “risk and opportunity,” an actuary’s expertise can greatly assist small and medium-sized businesses in gaining significant insights into operational and financial performance. Of potentially greater importance, by applying actuarial techniques, a company’s management can be nudged into making decisions that have the maximization of shareholder value as a constant guiding principle. Plaintiffs: to calculate the loss arising as a result of motor vehicle accidents. This blog post will explore some of the ways in which applying an actuarial valuation methodology to any product, service or business—in particular those with annuity type cash flows—can greatly assist in strategic decision-making. This is particularly pertinent in these days of SaaS and subscription-based business models. The pursuit of value should permeate a business’s decision-making process. A company’s management should make strategic decisions based on whether they will increase the long-term value of the company to shareholders, rather than any other financial metric. I do not believe that any management team of a small or medium business would argue that they do not intend to make the company as valuable as possible for its owners. It is rather a matter of practicality that this goal is often not at the forefront of their decision-making process, for how does one measure the implications to a business’s value of each decision? It is my contention that the use of an actuarial valuation method, or one which approximates it, is the most appropriate way to measure the value-add of a strategic decision. By quantifying the effect on a company’s value of each option being considered, management will have an incredibly powerful tool to enable it to make correct decisions based on the information available. The value of any asset (or liability, for that matter), whether tangible or intangible, is equal to the expected present value of the future cash flows, which will be realized from that asset. This is, in essence, the discounted cash flow valuation method, which is widely used in investment finance and corporate financial management. The use of probabilities to determine the statistical expected value of each future cash flow. This is the key differentiator. Simply put, the actuary will project forward each and every future cash flow, determine the probability with which the cash flow will occur, and then discount these probability weighted cash flows to the present time. By developing this valuation technique, actuaries crafted a method that explicitly allows for all the relevant contingencies that result from the uncertainty in the cash flows. 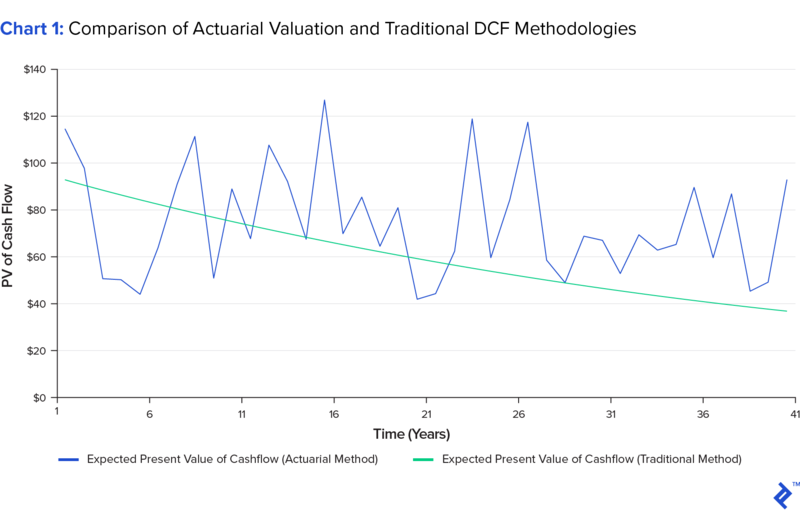 Chart 1 below shows an example of this, where the addition of longer-term cash flows with individual probabilities attached creates a far more irregular discounted cash flow curve than seen in traditional DCF measures. The actuarial valuation methodology can be applied to each and every product/service that a business offers. This can assist management in comparing the value added (or not added) by their different product lines. In turn, this should direct decisions on the viability of both current and future products. The actuarial method may also highlight the drivers of the relative success of the products which could inform the actions to be taken to rectify underperforming lines. By considering past adoption of new products, in particular, the adoption of new products by existing customers, the value of a new product can be determined with a fair amount of accuracy, provided that sufficient past data is available. Again, while the technique is fairly similar to the Net Present Value methodology, the ability to incorporate probabilities and contingencies into cash flows gives the actuarial technique an important advantage. In a similar way, an entire business can be valued. Both in-force business and future potential business arising from goodwill can be considered. Assuming that accurate assumptions are used, this could be the most appropriate way to value an annuity type business with sufficient data. Actuarial values take into account the future profit on in-force business so the assessment of business performance would not be distorted by new business strain. By taking into account the future profit on in-force business, actuarial values also better reflect the value of this business than accounting numbers, which only reflect current earnings. Platinum Life, a niche South African life insurer, has partnered with a number of businesses using these actuarial valuation principles. By converting traditional retail or service businesses into membership-based business models, they have created companies supported by annuity income. They have replicated this approach in industries as diverse as cosmetics and software, fashion, education, and nutrition. Their actuaries analyze every new product envisaged for its expected value added to the business. How Do I Obtain the Expected Probability Statistics? The numerous contingencies which affect each cash flow are calculated using statistical tables. These tables are usually the result of studies that assess past experience and the actuary’s estimation of how this past experience will change in the future. For life policies, relevant tables would be those used to determine the probability of a person’s survival, of them becoming disabled, or of them discontinuing their policy. The tables used in other businesses would be those relevant to the specific business, product, or project being valued. Take, for example, a publishing company that offers subscription-based magazines or newspapers. The development of a statistical table from which subscription renewal rates could be predicted would be the key input into an actuarial model. By analyzing the subscription trends of past cohorts, such a table could be developed. One would expect renewal rates to increase as the cohort ages. In other words, the expected probability that a customer who has been subscribing to a title for ten years will renew their subscription is greater than a subscriber of two years. The grouping of the titles offered by the company for this analysis would depend on the homogeneity of their characteristics as well as the sufficiency of past data. A cohort analysis is a great tool for creating such probabilities by narrowing retention and behavioral rates to classes of customers. Through looking at retention rates for past cohorts, a business can project out its future cash flows with more certainty and then tweak its marketing tactics to improve any negative trends. Figure 1 below shows an example of such an analysis alongside a brief explanation. The actuarial valuation methodology can, therefore, be used to determine the value-add of any uncertain strategic decision. Each option can be valued independently, and the option which results in the greatest additional value to the company can be chosen. The advantages to the approach stem from the application of probabilities to each cash flow. In this way, correlations between different risks and between different products, services, or departments can be considered. The applications of the actuarial method are of particular value to businesses which generate annuity type income. The structure of these products mimics that of insurance products; take-up rates, persistency rates, and the increase in revenues and costs can all be modeled, and important business decisions can thus be made with key information now in the hands of management. The total net profit that a business earns, on average over the course of its relationship with a customer, is known as customer lifetime value (CLV). CLV represents an upper bound for the cost a business should spend to acquire a customer, which is referred to as customer acquisition cost (CAC). The merits of calculating an accurate customer lifetime value are numerous and its value can be critical in determining a business’s marketing strategy. A number of different marketing strategies exist depending on the type of product being sold. These range from complex sales, which may take months of the CEO’s time to acquire; to personal sales, which require a sales force to directly contact potential clients; to viral marketing, which relies on users to invite their friends to become users too. Determining the correct mix of marketing strategies is crucial to the success of a product, and the nature of the product will, in most instances, restrict the strategies available. Companies such as Elon Musk’s Space X, which has signed billion-dollar contracts with NASA, are totally reliant on complex sales; with a customer lifetime value that high, almost any amount of time and direct energy from the CEO is worth the cost. On the other hand, the CLV for PayPal was much lower. Traditional advertising, even online, proved too expensive. PayPal discovered that the most cost-efficient method to acquire customers was to actually pay them to join—and then again to refer new customers. The sales technique used by PayPal was only made possible because they had a good idea of its customer lifetime value. Many businesses, however, are not aware of the value of acquiring a new customer which leads them to employ an incorrect or cost-inefficient marketing strategy. By focusing solely on the profit generated from the customer from the initial sale, or even in the first year or two, a company could significantly underestimate its CLV. Management may, therefore, myopically, spend too little on marketing or may employ an incorrect strategy or distribution channel. As in Chart 2 below, the value derived from a customer increases significantly in future years. In addition, a business may err in considering the customer lifetime value for a particular product in isolation. However, once a customer is acquired, it opens up opportunities for cross-selling both current and future products. A customer’s likelihood to purchase additional products can be modeled, and the value that this unlocked can then be considered in the CLV calculation. Customer lifetime value can also be valued per salesman or client relationship manager. This can be an extremely effective way of monitoring (and rewarding) performance. The use of the actuarial valuation methodology for employee evaluation is discussed later in this article. What are the retention rates of our clients? By improving retention rates, by say 5%, how much value will that add? Is it more important to focus on improving customer retention or on acquiring new customers? In other words, is $1 spent on marketing more valuable than $1 spent on maintaining a customer relationship? What is the correct balance? What is the value of a new customer to the business as a whole, as opposed to just one business unit? Depending on the type of business, modeling customer lifetime value can vary in complexity. An actuarial valuation of CLV, applying the actuarial valuation method described above, can be a sophisticated and powerful method of accurately modeling this important metric. Although it may be very useful, it is impractical to use actuarial valuations for day to day decisions made by a business. However, an actuarial valuation can be performed to determine the key metrics which are responsible for driving a business’s value. Typically, businesses use financial metrics, such as revenue and operating income, to assess the performance of products, units, or managers. These metrics, particularly when used as quarterly and annual measures, are not reliably linked to the long-term cash flows that produce shareholder value. It stands to reason that employee incentives should also be aligned to the increase in value added by each manager or employee. Apart from assisting management decisions, these metrics can, therefore, be used to determine the performance of executives and employees. Incentives and rewards can thus be linked to these metrics. Looking at the components that add to customer lifetime value (Figure 3), there are many interrelated components that, if isolated, can be correctly incentivized to enhance performance. 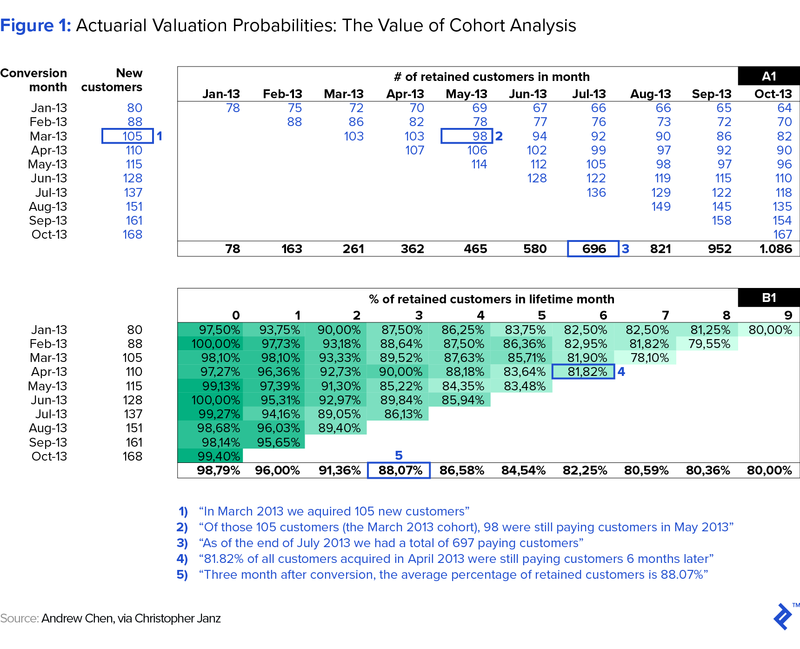 The actuarial valuation technique can be used to assess the value added by competing metrics that have been identified. The metrics which result in the greatest increase to the business’s value would be chosen to be used in employee evaluation. For example, borrowing from the analysis of customer lifetime value, if it is shown that customer retention adds more value to a business than the acquisition of new customers, employees should be rewarded more for improving retention rates than for acquiring new customers. The actuarial valuation technique is, therefore, consistent with his view of how a company should be run and how strategic decisions should be made. Since the actuarial technique considers long time periods as well as the uncertainty of cash flows, it is my contention that it is the most appropriate valuation and metric technique for many businesses—particularly those which have annuity type income as well as sufficient past data. Those that understand the actuarial valuation can bring significant value and insight through their valuation analysis. The statistician George Box’s aphorism, that “all models are wrong but some are useful,” is often quoted (at least in actuarial circles). It is as true in the context of this article as it is in general. A model is, by definition, a simplification of reality; it can never predict the future perfectly. Using the actuarial valuation technique cannot be a panacea to solve all decisions that a business needs to make. The technique is heavily dependent on the quality, sufficiency, and availability of relevant data. It is also highly sensitive to the actuarial assumptions used. However, the use of the actuarial technique, together with other relevant measures, can provide management with extremely useful insights into their business and can greatly assist in the creation of value for shareholders. Previous articleautomated testing – Failed To Launch IE Driver Using Selenium WebDriver?